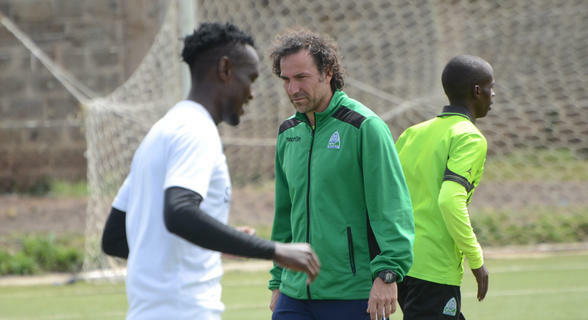 Gor Mahia are 180 minutes away from sealing a historic place in the CAF Champions League and a payout of Sh54mn if they beat Nigeria’s Lobi Stars in the first round of their CAF Champions League tie. The Kenyan champions face their Nigerian counterparts on Sunday evening at Kasarani in the first leg of the tie. Gor were at this same stage last year but lost to Egyptian giants Esperance 1-0 on aggregate with the North Africans going all the way to win the Champions League crown. This year though, they aim to go all the way and are not interested in dropping to the Confederations Cup. New coach Hasaan Oktay is upbeat his side can maneuver past the Nigerian champions and has asked his players to play with belief and go for the challenge. “It will be a very tough game for us, but we have to play our best and win. We have to avoid conceding at home and if we can score a goal or two, that would be great for us. I trust in the players,” Oktau who was only confirmed as the coach early this week said. The side comes into the match with confidence from their 4-0 midweek win over Zoo Kericho in a league fixture and hope to replicate the same result against Lobi. Lobi won the Nigerian title for only their second time, the first being in 1999. They also won the season-opening Nigerian Super Cup this season after beating Enugu Rangers 1-0 on November 21. They were declared champions after the Nigerian League management Committee made a decision to halt the league after 24 games with Lobi on top so that they adhere to the new calendar rules by CAF. Lobi, known as the Pride of Benue, were leading the standings with 43 points after 24 games. There would have been 14 games left to play in the season had the management committee not decided to halt the league after 24 games. They were concerned about missing the October 15 deadline set by CAF to present teams to participate in the continental tournaments. This is their second ever appearance in the Champions League, having made their debut in 200. They have played thrice in the Confederations Cup, in 2004, 2006 and 2012 and never went past the second round.